Big Sky Colony v. Montana Department of Labor and Industry. The Becket Fund for Religious Liberty (n.d.). Retrieved from https://www.becketlaw.org/case/big-sky-colony-v-montana-department-labor-industry/. Big Sky Colony v. Montana Department of Labor and Industry. (Apr. 04, 2019). https://www.becketlaw.org/case/big-sky-colony-v-montana-department-labor-industry/. "Big Sky Colony v. Montana Department of Labor and Industry." The Becket Fund for Religious Liberty. Accessed [Apr. 04, 2019]. https://www.becketlaw.org/case/big-sky-colony-v-montana-department-labor-industry/. 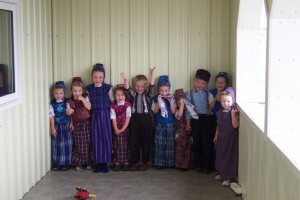 The Hutterites are a peaceful and industrious people who have lived every aspect of their lives in religious communities for almost 500 years—eating meals in a communal dining hall, educating their children in a communal school, wearing the same homemade clothing, and working together on a communal farm. All Hutterite members take a vow of poverty, renounce private property, and hold all their possessions in common. They devote all of their time, labor, and energy to the community as an act of service and religious devotion. They also pledge to resolve any disputes among themselves without using secular courts. They have been successfully living by these religious principles for almost 500 years. In 2009, however, powerful labor unions and construction lobbyists in Montana complained that Hutterites receive a supposed “competitive advantage” because they do not pay wages to their members, and therefore are not required to provide workers’ compensation insurance. In response, the state passed a new law forcing the Hutterites to provide workers’ compensation insurance for their members. The new law would force the community to violate its 500-year-old commitment to holding all possessions in common, working without expectation of compensation, and refusing to assert legal claims against each other. The new law is also pointless, because the Hutterites already provide expensive, comprehensive medical care to all of their members, regardless of the reason for their illness or injury. Thus, the workers’ compensation requirement does nothing to protect the health of Hutterite workers; it only forces the community to violate its religious beliefs. Unfortunately, because Hutterites shun politics and do not vote, the legislature never consulted them before passing the new law, and was unaware that the law would serve no purpose. When the colony discovered that they would be forced to violate their religious beliefs, they petitioned the Montana state courts for relief. A district court decided that the law violated the First Amendment because it was “drafted with such care to apply only to Hutterites,” and because it imposed “property rights concepts [that are] forbidden by the fundamental communal living and community of goods doctrine upon which the [community] is founded.” In a sharply divided 5-4 ruling, the Montana Supreme Court reversed that decision. The Hutterites then asked Becket to appeal their case to the U.S. Supreme Court in 2013. The Supreme Court declined to hear the case, but Becket ultimately helped the Hutterites work out a solution with the Montana legislature. Today, the Hutterites continue to live in accordance with their religious beliefs without legal persecution.